Science centers may seem commonplace today. However, that was not so four decades ago, when total attendance at my first ASTC conference was about 50. Reviewing the history of the field, beginning with those institutions that influenced its development, can offer perspective for considering future directions. Science museums have evolved over hundreds of years, beginning with private collections of rare objects. 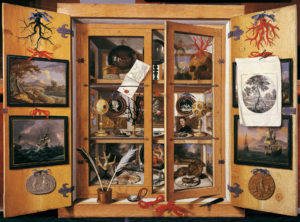 During the Renaissance, they took the form of “cabinets of curiosities.” They gradually transformed into institutions where scholars could study them, as “natural philosophy” transitioned into empirical science. The first open to the public, Oxford University’s Ashmolean Museum (1683), included botanical, geological, and zoological specimens. Starting in Europe in the latter 18th century, national museums with natural science collections were established, along with Charles Wilson Peale’s Philadelphia Museum (1786). Natural history societies also created museums to display specimens gathered by their “gentlemen scientist” members. Collections were the primary feature of these natural history museums; their mission was preservation and generation of scientific knowledge by curators. They provided the foundation for 19th-century “naked eye” biological research, later overshadowed by university-based laboratory research as the sciences professionalized. To facilitate study, large numbers of specimens were organized by their taxonomic classification and mounted in row upon row of display cases. By the early 20th century, following a “golden age” of museum building, greater emphasis was being placed on public education. That led to more didactic displays with fewer specimens and the hiring of education guides. Some collections, such as vertebrate paleontology, became especially popular. Natural history museums began collecting specifically for display and teaching; amateurs studied field guides to identify and donate specimens in an early form of public participation in science. The years to follow elevated the role of exhibition makers and design. Combining approaches from department store windows and theatrical lighting with use of false perspective, natural history museums created dramatic habitat dioramas displaying wildlife in naturalistic settings. These exhibitions significantly increased public attendance and school group visits, but reduced funds for scientific research and created conflict with curators. Today, due to biodiversity loss and global climate change, natural history collections have gained new significance. “Industrial” museums evolved from earlier technical museums, such as the Musée des Arts et Métiers (1794) in Paris, which featured machines, instruments, and scale models. Other major influences were international expositions and World’s Fairs, beginning with the Great Exhibition of the Works of Industry of All Nations, commonly known as the “Crystal Palace” Exhibition (1851); London’s Science Museum (1857) was the first of many legacies of buildings and collections. Under the leadership of Oskar von Miller, the Deutsches Museum (1906) in Munich enlivened historical artifacts with working models, visitor-activated devices, and demonstrations. This new model, designed to illustrate applications of science and technology fostered by the Industrial Revolution, inspired others. The New York Museum of Science and Industry (1930) was first in the United States, but closed for financial reasons several decades later. It was followed by Chicago’s Museum of Science and Industry (MSI, 1933), whose rotunda reads: “Science discerns the laws of nature. Industry applies them to the needs of man.” Some built on earlier roots, such as the Franklin Institute (1934), which began as a “mechanics institute” for adult technical education in 1824. Although these museums typically maintained collections, their primary focus was public education rather than curatorial research. They used motion and visitor participation to activate thematic exhibitions, beginning with push buttons, cranks, and levers. Children became a major focus, either to broaden educational impact or perhaps to distract them from other exhibitions, as with the Children’s Gallery (1931) at the Science Museum (London). This interactive approach was subsequently adopted by many natural history museums as well—some turning into broader science museums, beginning in Buffalo and Boston. A white paper by the Center for Science in the Public Interest (1979) criticized many science museums of the era for being similar to trade shows, due to corporate sponsorship like World’s Fairs. That report became the impetus for my transition from chemistry professor to research coordinator at Chicago’s MSI, where an overtly pro-nuclear exhibition sponsored by an electric utility had drawn protests. The growing role of public education ultimately led to “museums” with no collections at all. Oriented toward experiences and phenomena rather than historic artifacts, these institutions chose to identify themselves as “science centers“ or “science-technology centers” to differentiate themselves. Their emergence was accelerated by the Cold War and launch of Sputnik (1957), which led to science education reform and creation of the Public Understanding of Science program at the U.S. National Science Foundation (NSF). This new type of museum had been foreshadowed decades earlier by “scientific theater” at Urania (1888) in Berlin and science demonstrations by University of Paris students at the Palais de la Découverte (1937). They also drew from a tradition of science popularization since the Age of Enlightenment, as well as a growing number of children’s museums, starting with the Brooklyn Children’s Museum in 1899. The 1960s brought the Pacific Science Center (1962), New York Hall of Science (1966), Lawrence Hall of Science (1968), Ontario Science Centre (1969), and the Exploratorium (1969), which became the model for a new generation of science centers based on Frank Oppenheimer’s ethos of open-ended exploration. Exhibitions were created not by designers, but by scientists, “tinkerers,” and artists who challenged the existing science museum paradigm, reflecting the counterculture of the period. Building on this “library of experiments” developed for teaching physics, the Exploratorium offered hands-on experience with “props” intended to foster intuition and understanding of scientific phenomena, initially focused on perception. Although some found frustrating the lack of direction exploring these “woods of phenomena,” the intent was to instill awareness and discovery, rather than convey particular scientific content. “Cookbooks” and professional development programs facilitated widespread replication of Exploratorium exhibitions, reducing barriers but increasing homogeneity among many existing and emerging science centers around the world. ASTC was founded with 20 institutional members in 1973. Two years later, the American Association of Museums, now the American Alliance of Museums, (AAM) revised its definition of “museum” to drop the requirement for collections, making science centers eligible for accreditation. Without a need for collections, the field rapidly expanded. ASTC membership climbed to 170 in 1984 and further jumped to 438 in 1994, facilitated by the Institute for New Science Centers (1987). Science centers outside the United States organized their own regional associations, beginning with Ecsite (1989) in Europe and RedPOP (1990) in Latin America, to be followed by ASPAC (1997) for Asia/Australia and NAMES (2006) for North Africa/Middle East. India had previously created its own National Council of Science Museums (1978). Since enacting the world’s first law on popularization of science and technology (2002), China has seen its own boom in museum building. Institutional models now range from decontextualized stand-alone phenomena-based exhibitions to more comprehensive narrative-driven thematic exhibitions to complete immersion within a unified contextual setting (Science City at Union Station, 1999). Other approaches include an outdoor science playground (1998) at the New York Hall of Science and a fully interactive outdoor science center, the Clore Garden of Science (1999) in Israel. The California Science Center has integrated large scale multiple diverse experiences, adding live plants and animals (2010) and an actual Space Shuttle (2012). Science centers have developed many education offerings for school groups, teachers, after-school programs, families, and public audiences. Formation of a professional organization for educators, the Museum Education Roundtable (1969), reflected their growing institutional role. Columbus, Ohio’s Center of Science and Industry (COSI) introduced an innovative overnight Camp-In program (1972) for Boy and Girl Scouts. ASTC formed the Teacher Educator Network (1990) to enhance the skills of those science center staff who worked with schools. K–12 curriculum materials have been developed by The Lawrence Hall of Science and many others, such as the National Center for Technological Literacy (2004) at Boston’s Museum of Science. Some institutions have partnered to form museum-schools, and are exploring ways to leverage their roles within regional STEM learning ecosystems. Partnering with ASTC, the (U.S.) National Science Teachers Association created the journal Connected Science Learning (2016) to bridge the gap between in-school and out-of-school settings. Adult audiences are gaining greater attention through science cafés, forums, and other public engagement activities. ASTC Exhibition Services (1974) was formed to help meet a growing demand for traveling exhibitions, stimulated in part by Treasures of Tutankhamun (1977), which drew 1.35 million visitors to Chicago’s Field Museum. This focus on “blockbusters” elevated the role of financial and marketing staff in decision making, raising issues of allocation of limited resources and educational mission versus entertainment. A professional organization for exhibition developers, the National Association for Museum Exhibition (NAME), formed in 1981. A group of large science centers created the Science Museum Exhibit Collaborative (1983) to share development costs. A related effort produced the Museum Film Network (1985) as science centers added giant screen theaters, following installation in 1973 of the Fleet Science Center OMNIMAX theater. ExhibitFiles (2006) established an online community for developers to preserve records of exhibitions and to share experiences. Following publication of Make: magazine (2005), makerspaces have become a recent trend. Increasing attention has been devoted to reaching underserved groups. Early efforts included the Exploratorium’s High School Explainer program (1969) and the Science Career Ladder (1986) program at the New York Hall of Science. With grant support, ASTC launched the Youth Achievement through Learning, Involvement, Volunteering, and Employment (YouthALIVE!) initiative (1991), funding some 72 science center teen programs. The subsequent Equity and Diversity Initiative (2001) created the ASTC Diversity and Leadership Development Fellows Program. More recently, science centers have been seeking ways to become “necessary” to their communities rather than simply “nice” to have, a challenge emphasized by the Noyce Leadership Institute (2008–2015) professional development program for 123 fellows from 95 institutions. Science centers have long faced skepticism that visitors are actually “learning” while enjoying themselves. Efforts to draw from research and evaluation to try to address this issue accelerated in the 1990s, coinciding with emergence of the “learning sciences” within academia. That decade included formation of the Visitor Studies Association (1990) and publication by ASTC of What Research Says About Learning in Science Museums (1990, 1993). NSF began encouraging project evaluation, and later requiring it as a component of grant proposals, disseminating reports on the website informalscience.org (2003). While at NSF, I had the opportunity to further this effort by initiating the Center for Advancement of Informal Science Education (CAISE, 2007), the Framework for Evaluating Impacts of Informal Science Education Projects (2008), and the (U.S.) National Research Council report Learning Science in Informal Environments (2009). That research synthesis study significantly broadened a school-based definition of learning to include the critical dimensions of fostering an interest in science and a science-related identity. CAISE continues to provide the field with research-based reports and free access to learning sciences literature. The world is very different today from the time when most science centers were planned and opened. The populations of many developed nations are aging and diversifying. Economic inequality is on the rise, breeding polarization and distrust. Technology enables ubiquitous access to nearly unlimited resources, but many people are uncomfortable with the accelerating pace of change. Scientists can readily communicate online without the need for intermediaries. Science centers clearly face increasing competition, both virtually and from other organizations offering their once unique experiences. Fixed operating costs often make their financial model precarious, necessitating restrictive admission fees. To keep up, science centers have been renewing exhibitions, adding programs, and seeking further sources of earned income. Will these kinds of incremental changes be sufficient, or will new models be needed? If the latter, will they come from outside, threatening existing institutions? In the 1980s, in an overview of the emerging field, the then-president and director of Chicago’s MSI responded optimistically to the challenges of that era: “[Science centers] will continue to evolve, improve, and develop new approaches as they respond to society’s changing needs.” (Danilov, 1982, p. 12). By building on research and evidence-based practice, innovating, collaborating, and taking strategic risks, the field can increase its odds of attaining that favorable outcome and thriving in the years to come. David A. Ucko is president of Museums+more LLC in Washington, D.C.
Cole, K. C. 2009. Something incredibly wonderful happens: Frank Oppenheimer and his astonishing Exploratorium. Chicago: University of Chicago Press. Conn, Steven. (2010). Do museums still need objects? Philadelphia: University of Pennsylvania Press. Danilov, Victor J.(1982). Science and technology centers. Cambridge: The MIT Press. Friedman, Alan J. (2010, October). The evolution of the science museum. Physics Today: 45–51. National Research Council. (2009). Learning science in informal environments: people, places, and pursuits. Washington, D.C.: National Academies Press. Rader, Karen A. & Victoria E. M. Cain. (2014). Life on display: revolutionizing U.S. museums of science and natural history in the twentieth century. Chicago: The University of Chicago Press. Ucko, David A. (2010). NSF influence of the field of informal science education. Ucko, David A. (2013). Science centers in a new world of learning. Curator 56(1): 21–30.